A Christmas wish from the little guy at the north pole. 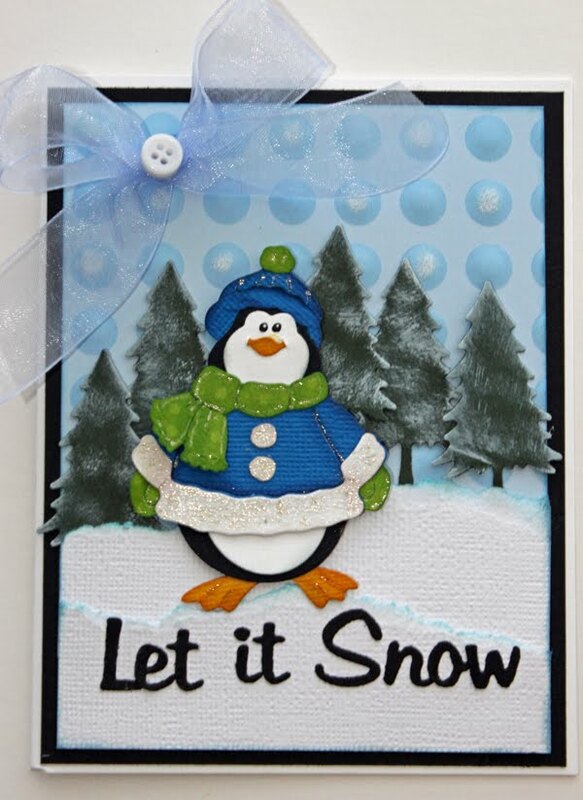 This Eskimo is from the Cottage Cutz Christmas die called ESKIMO w/IGLOO. 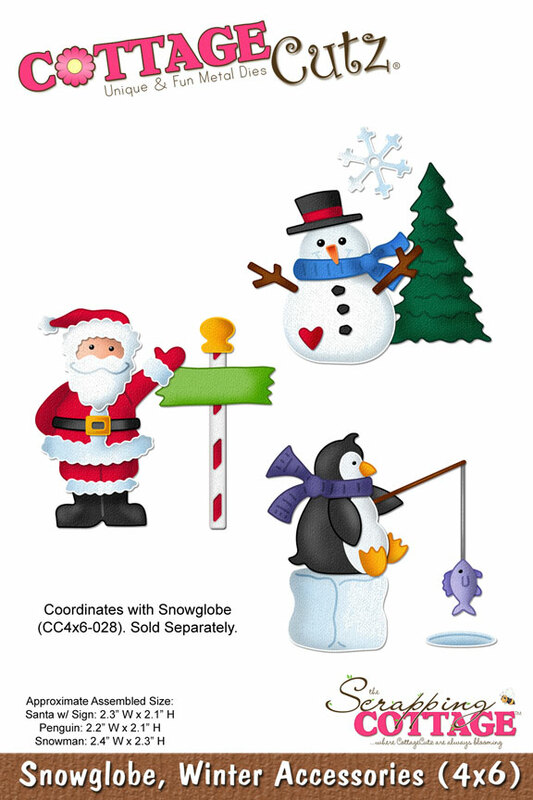 The die comes with the Eskimo, an Igloo and a fish on string. the Eskimo can be made into a girl or boy. Just cut to extra hairpieces and split a bit off and use on the sides. The snowflake came from the Snowman in Mug die, and I just received my order of Alphabet dies and used the Cottage Cutz Hopscotch alphabet set. It saw just the size I needed. Here in Virginia it is just starting to show a few signs of cold, so it can get everyone in the Christmas spirit. . somehow the weather always helps. Hello everyone Cheryl here with a Recipe Card for The Scrapping Cottage using the DARLING Mr. Chef Mouse Cottage Cutz. I just LOVE this darling lil' mouse, he is soo sweet! 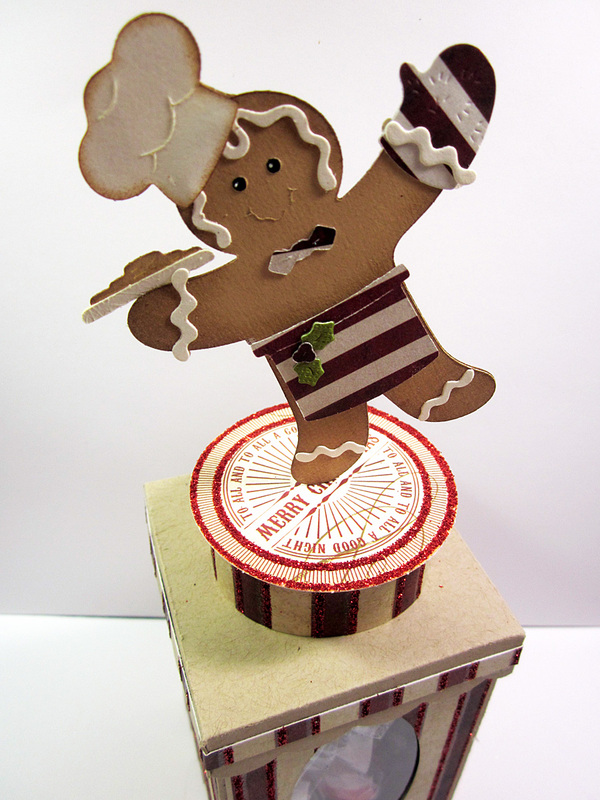 I thought this cottage cutz was perfect for a Recipe Card, and the design paper too. Mr. 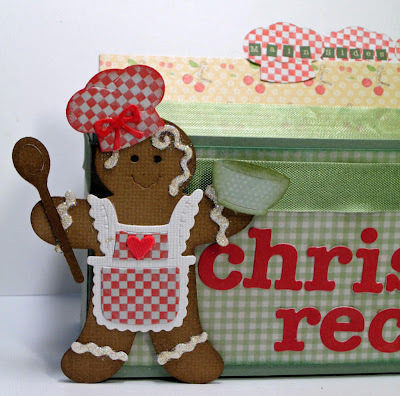 Chef Mouse was cut out with grey,green,white card stock. I dusted the apron and cap with tim holtz distress ink. the bowl was colored with copics, and so was his bow tie, and shoes. I had my daughter print out a recipe from my computer in my craft room and bring it up to me :) i then added the name of the recipe and the ingredients to the front and the directions to the back. I hope you enjoyed my Recipe Card for today, and thank you for looking! Enjoy your week! Life is a Song, SING IT!!! I love great quotes and would adore having a few of them framed and hanging on my walls. This got me thinking and my mojo kicked up a gear. 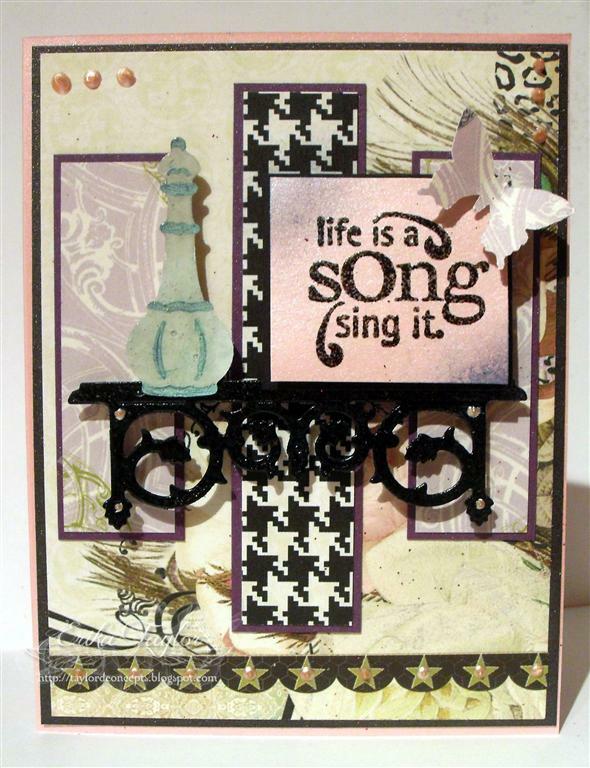 Hi everyone Erika Taylor here today to share with you a card I created using the Spooky Iron Shelf and Potion Bottle Mini dies from the Scrapping Cottage. I wanted to show you today how easy it is to use some of the holiday dies for different occasions. For the Shelf; I embossed it with a wrought iron embossing powder to give it an antique feel.The Potion bottle is colored with a bit of Faber Castell Metallic Pitt Pens. 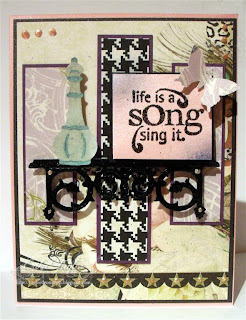 I paired the dies up with some beautiful Websters Pages papers and a stamp from Unity Stamps. This is piece that I came up with. And to think, I used Halloween dies. Whodda Thunk!!! Try using holiday dies for other occasions. The possibilities are truly endless. Thanks so much for stopping by today. I hope you all have a fantastic week. Hello Friends! Today I have a few ideas to share with you. I used the Cottage Cutz Snow Globe and Snowglobe, Winter accessories die. This is such a fun die with so many possibilities. I have 2 globes assembled and ready to put on a card. While looking at the globe it reminded me of an ornament, so I used a Cottage Impressions stamp, Cardinal with Holly Stamp. 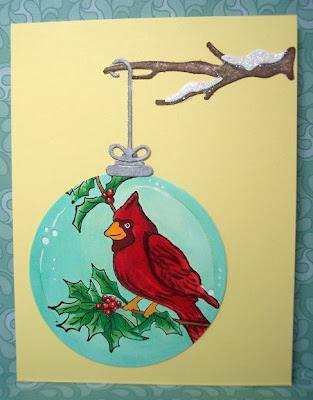 I also used the branch and ornament hook from the Winter Bird With Ornament die. I hope you feel inspired to look at your dies and the many ways they can be used. Thanks so much for having a look. The Christmas Season is Officially Here! Thanksgiving is officially behind us and Christmas-time is here! I hope you had a very blessed Thanksgiving and had time to enjoy your family and loved ones. We are all so blessed and it is so great to have a day that reminds us of that! But now, Christmas is really here - so let the carols play on the radio, let the tinsel sparkle, and let's finish all of those Christmas cards that we said we would finish in July, and we just haven't gotten them done. 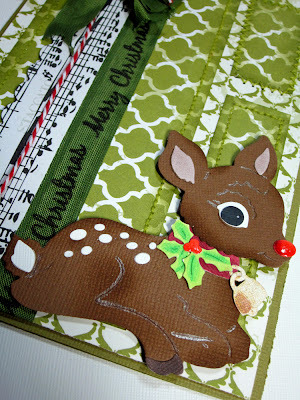 I used the Christmas Fawn Die from CottageCutz for today's project. Don't you just love all of the details? I had to add a little Sakura Crystal Lacquer to her little red nose. Also, did you notice my stamped seam binding? I thought that was a perfect place to add my sentiment. 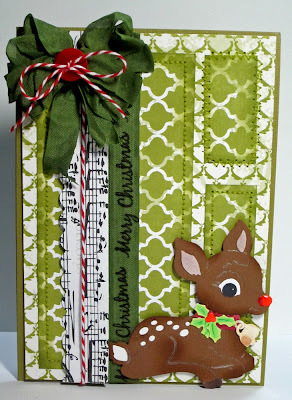 The stamp came with the Boxwood Vine Wreath set - and I keep using it over and over again! I hope you have a wonderful holiday season. Don't forget to check out the special Black Friday release from CottageCutz! Happy Thanksgiving, Welcome Holidays, Bring on the Sales! Hi Everyone, it's Lori here today on gobble, gobble day. I hope all of you have plans to be with friends and family this weekend and celebrate everything we have to be thankful for. I heard a little saying not to long ago about if you had tomorrow everything that you had thanked God for today, what would you have? I know my list would honestly be to long to name. One thing I am thankful for is the wonderful design teams I'm able to serve on. Scrapping Cottage has been so good to me and I feel so blessed to have been able to be on it with my best friend and sister Gini...yeap, I'm truly grateful. Today I created a simple holiday card using Whimsical Tree. 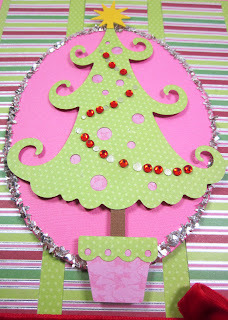 I always think of Dr. Seuss for a little whimsy and pink and green...Go figure. I love how our dies help you create really unique cards in no time, so simple but really eye catching. 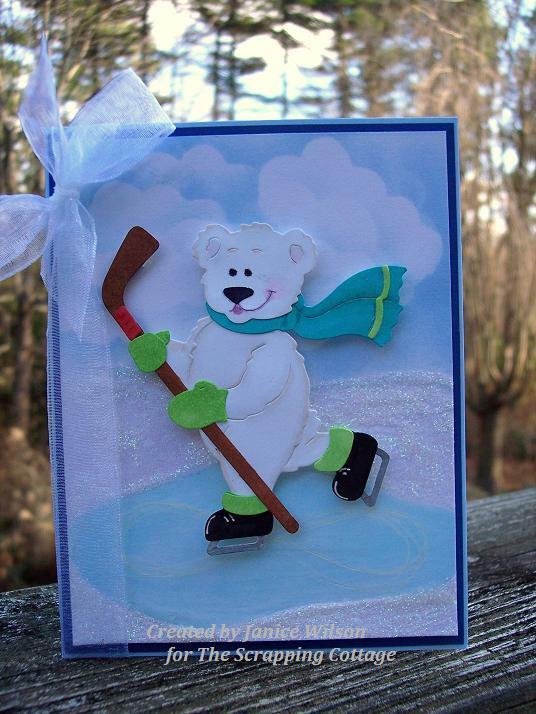 I know I would love to get a card like this in the mail. I hope you gets lots of holiday shopping done this weekend and be sure to check out our sale.... and we don't even have lines you have to stand in. You can get dies up to 50% off...so you'll want to check it out. It's a great time to pick up some holiday gifts for you, your family and friends and then a little more for you, LOL. Have a blessed weekend and I'll see you soon. 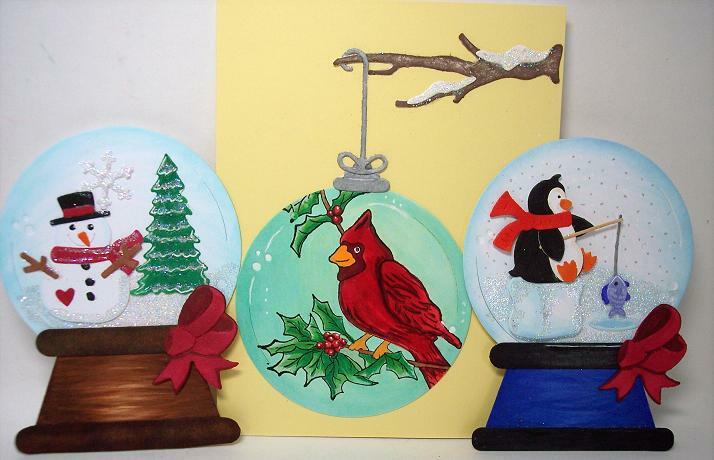 We're so excited to present you with the 2011 Black Friday Winter Release of 8 new dies. Our Design Team has created a card or project for each of the new dies. We hope you enjoy our new winter release! First I have Mr.Chef Mouse, he is sooo SWEET I really wanted to make a Recipe card for todays post and just didnt have enough energy to do it, so instead i figured i would share what i had put together :) Now I used Tim Hotlz distress inks for most of his highlighting, the bow,bowtie,and spatula i colored with copics. His chef cap, and his apron i distressed with antique linen, Mr. Chef was cut out with grey card stock and then distress a tad with a shade of blue. For his green outfit i used a tim hotlz green that i had next to me. I cut all her pieces out with a wide column card stock, thats what gives the lines in her. Next I distressed her with a blue ink, for her apron i distressed with a pink and same for her cupcake top. The heart,bottom of apron,holly berry,cupcake wrapper,and wooden spoon are all colored with copics. Her pan hat is colored with 3 different grey copic markers. Lastly I added some stickles to her pearls and the cupcake icing. I hope you all have a wonderful Thanksgiving, and thank you for stopping by!! You melt my heart ! Hello from Singapore, everyone ! that is using chalks to color die cuts cut out of white cardstock. a little subtle shading to the body of the snowman, black chalk for the top hat and blue for the snowman's scarf . I also used 2 shades of green chalk on the pinetree . I've used American Craft's Glitter Gel pens . new combo of using chalks with gel pens on my diecuts. 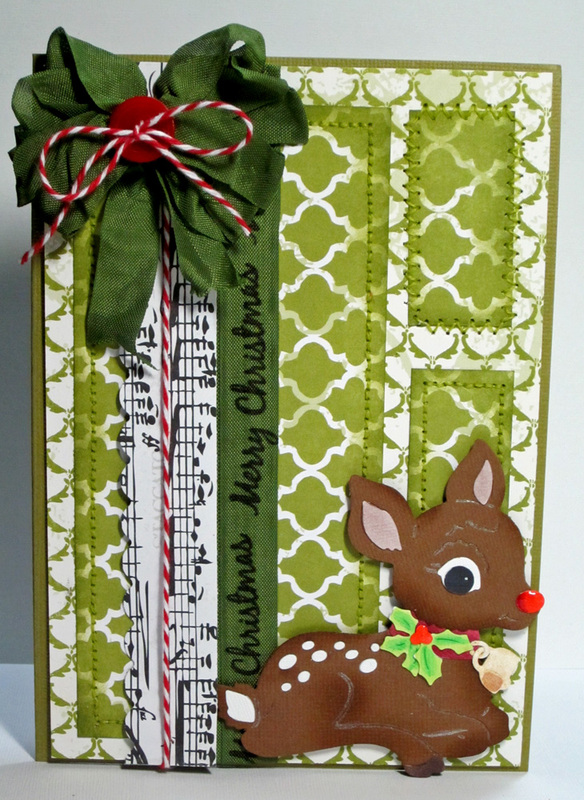 This week I made a project using the Cottage Cutz Santa Peeker die. I wanted to trim a triangle treat box. I thought the shape of the Santa worked well with the triangle. I added a belt and buckle to the box. The handle was made with a metallic red pipe cleaner and I wrapped the pipe cleaner with the new Martha Stewart metallic eyelash yarn. The Cottage Cutz Santa was highlighted in Copic markers. If you can see above I used #C5 grey (left) than blended it out with #W0 grey (right). . than went back with the blender and worked it all out. Mrs. Clause likes a little grey in Santa! She thinks it makes him look a bit frisky! These two cards were a little demo, make n' take class I did. I needed two simple cards . 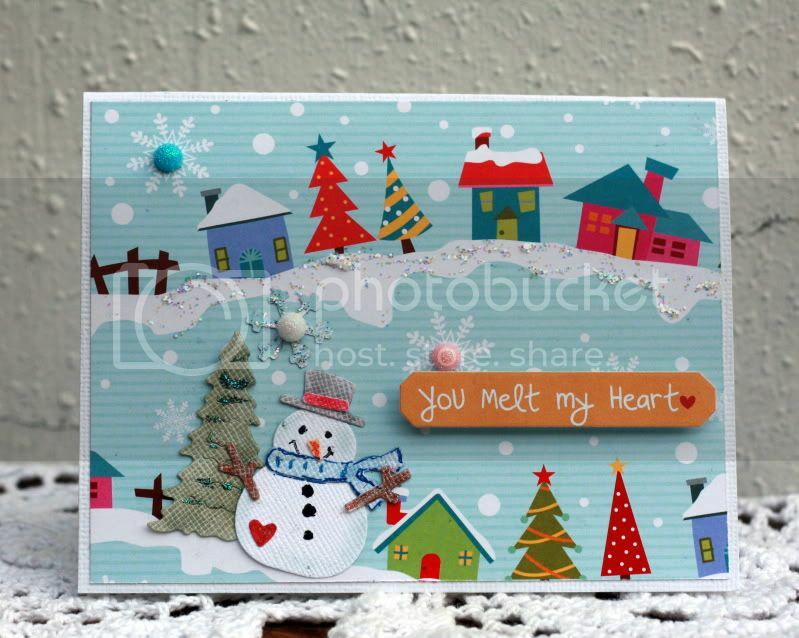 The first is using the Cottage Cutz Ornate Poinsettia die. You can't tell from the photo. . but the gold and the white is sparkle paper. I used Stickle red for the berries. 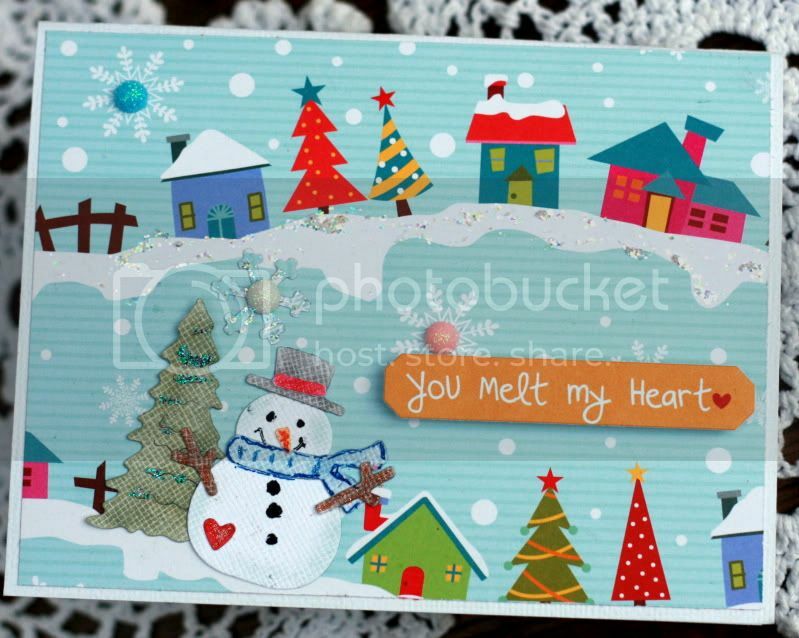 This card I used the Cottage Cutz Snowflake Doily and the Cottage Cutz Snow Globe Accessories die. This is a second snowflake I made, I really liked the tree on the other side of the snowman away from the dark scarf.